With an extensive background in computer science and information technology as well as the entertainment, music and mobile industries, Elie Habib and Eddy Maroun crossed paths and founded Anghami, a platform providing access to over five million international and Arabic songs through a convenient, user-friendly application allowing users to stream all the music they want on their mobile. Anghami has agreements with over 4,000 record labels, thus granting users access to the widest variety of content in the region. The mobile application is available for download on different smartphones, including iPhone, Android, Windows Phone, Blackberry, and Nokia devices. The company offers a free, ad-supported version of the app, which allows usage only with an Internet connection. Anghami+, the premium ad-free application, allows users to stream an unlimited number of songs and to access playlists when offline. Anghami has partnered up with MBC and added songs from popular shows like Arab Idol, The Voice, Your Face Sounds Familiar and Coke Studio to its musical library. Anghami continues to expand its network of paid subscribers through partnerships with telecom operators, which provide the Anghami application as a service to mobile phone subscribers in certain countries. Elie and Eddy were selected as Endeavor Entrepreneurs in October 2013 in Palo Alto. By August 2014, Anghami had more than 6 million users. We have interviewed the co-founders for an insider’s look at social media in relation to the local/regional musical industry. How did the idea of Anghami come forth? In 2011, while traveling, Eddy Maroun and I, Elie Habib, noticed services allowing users to listen to any song they want. Unlike iTunes, such services—called streaming services—opened up a big catalog, enabling searching for almost any song your heart [and ears] desired. Back home, we did not even have iTunes available. Call it a major opportunity. Eddy is originally a musician-turned-lawyer-turned-businessman, while I am a software engineer that had co-created several companies earlier on. The idea of creating something this challenging was unbelievably attractive to me. We were working in two different companies back then. I was intrigued by mobile apps, as I had no experience in this new field. Eddy really wanted to be able to listen to anything he wanted while skiing. We eventually made that happen. What made you invest in the music field in the Arab world? We believed in the idea and in the opportunity present at the time: no proper music service was available in the Middle East and North Africa region. We saw a huge uptake of smartphones and realized that this would be the focus of the new services. We were part of the previous phase of mobile music—ringtones, which was considered a useless trend by many. However, we knew how big it turned out to be. We were adamant in incorporating this trend into the region. In hindsight, we did not know how hard it would be and underestimated a lot while planning the project. However, we were definitely taken aback when we reached our first 2 million users in just 6 months! Who are Anghami’s direct and indirect competitors? Let us just say that piracy is our biggest competitor. Full stop. If you insist, I can add to that YouTube—which is the most prominent form of “legal pirating” in the music industry. Pirating music is not necessarily “illegal” in Lebanon and the Arab world. Why would people choose Anghami over piracy when they can manage their music library better outside the app? Music piracy is illegal—in Lebanon and the Arab World. However, penalizing piracy is very lenient, indeed. Nevertheless, piracy involves exposure risk to viruses and other malware, constant searching for the latest music, validating quality, metadata and others, as well as proper compression techniques to take the music with you on your mobile. How many of the 130 million estimated smartphone users in the MENA region do that regularly? And how would that compare to Anghami which provides an up-to-date, 6-million track database in a user-friendly interface with thousands of curated playlists, all in excellent Dolby sound? We would like to believe that the comparison is flawed, and our growth is a pretty good validation. Anghami is monetized by ads. From what I have seen, it is by far the application with most ad space—images and voice—which pushes users to upgrade. It also has the most basic features as premium paid features—such as using the application while not being connected to the Internet—. It is because of this, I think, that many users are being deterred from using it. Do you not think it is a little bit too much? Well, this is true for the free version—you might get one 15-second audio ad on Anghami every 4 to 5 songs, in comparison to 8 to 10 30-second ads every 15 minutes on the radio. It would be naive to assume that one can get all the music they want and get it for free, but that is what we are providing, in exchange for sponsorships and advertising. We are still tweaking ads and running a variety of experiments per market. We have not settled on the exact details. We are, however, getting a huge traction in this segment. From our point of view, we provide much more than a radio can do; interruptions are less than those on the radio, and music is handpicked. It is true that some people might consider advertising a deterrent; this is not our intention, but after all, the premium reason for start-up failure is lack of revenue. If you would like to download all you want and never hear an ad, this would cost you less than 1 latte grande and would last 1 month. How was Anghami initially funded? Has it become profitable yet? The first funders of the project were Eddy and me. At the time, it was quite crazy, as we did not know how we would fund the rest of the project. However, since we had a good background and had a record of implementing projects successfully, investors trusted our plan. Middle East Venture Capital invested the first USD 1m, eventually adding another USD 250k. A year later, an Arab telecom group invested USD 1.5m. While the growth of Anghami has been above our expectations; we expect to become profitable by early 2015. Tell us about your team. How did it start and how did it expand? And who do you think is the most valuable part of it? The first Anghami MVP (Minimal Viable Product) was coded by me and another engineer around October 2011. Anghami as a company was founded in February 2012. We were 3 at the time. 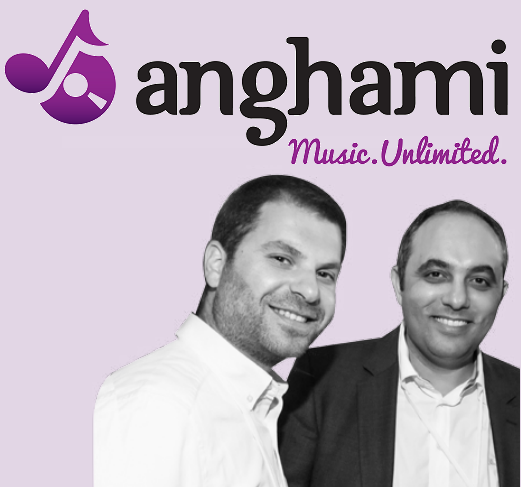 By the end of the year, Anghami launched in December 2012 with 6 employees. A year later, we were 18. We are now 28. The team is absolutely fantastic, passionate and obsessive. We would like to say that we try to recruit only very passionate people. We have backend engineers, mobile engineers, UX engineers, DevOps engineers, designers, marketers, business development and a very capable content team. Shameless plug: I am always recruiting. Since our business is really complicated, one part of the team could have never succeeded without the rest. Hence, as an example even though our engineering team is very talented, they would not have had any data to showcase without the content team. That is why we truly believe that we are all part of an atomic element referred to as start-up, with one target: growth to remain the music leaders in the MENA region. What is the most active demographic that is using your app? Why do you think it is the most active? (Country, age group, gender, etc). Youth in general (13-20 years old) is very active on Anghami, and youth in Gulf markets is even more engaged. We have seen cases of 24-hour listening in this demography. It is our belief that luck is born when preparation meets opportunity—and we really worked our way through this by targeting Anghami to this demography. We did not hit all the right notes from the start, nor are we totally satisfied with what we are now, but we are moving forward by keeping the most active fans in touch with their favorite artists. As a digital start-up in Lebanon, what hurdles did you face at the beginning and what are the ones you face now? When we started, the biggest hurdle was getting someone to take us seriously! We had an idea that needed millions of investment and no-revenue validation. Venture Capital Investment had just started, and we had no interest in joining an accelerator at the time. It did take close to 9 months to get funding, and trust. Now: USD 1,100 for generator and USD 1,500 in Internet monthly bills: Would that sum it up? On a more serious note, we worked hard in the spirit of having a start-up with one hub: Lebanon—working together with all the team in order to move forward. We regularly meet in our [now very small] lobby to discuss features, roadmap, revenue and future plans. However, we now find it harder than ever before to find fresh graduates that want to remain in Lebanon despite what is happening here, and while we totally understand this as founders and parents, we will have to open remote offices in cities that are pro-digital, low cost and millennial-centric. This seems to be very far from Lebanon, and is now the hardest hurdle we face. Would you consider moving your company to Dubai, especially that the situation is unstable in Lebanon? Why or why not? We recently opened an office in Dubai (see footnote in http://www.anghami.com/legal/), and while we believe Dubai is a great hub for advertising/marketing, and we have large partners there such as MBC, DMS Choueiri, Universal Music Group, Sony Music and others, the “kitchen” is still in Lebanon, as our team is currently entirely made up of people from Lebanon. Human resources are a goldmine to us, and while it has not been an easy trip to gather people with wide knowledge and experience to make Anghami, we are pretty sure that this would have been way harder and more expensive in Dubai. Most start-ups in Dubai end up recruiting from the Asian subcontinent, while we have pretty good universities and human capital in Beirut. How did you secure deals with the biggest names in Western music? Anghami started around a time when no significant legal music service was available. However, in the rest of the world, several music streaming services were available. Major music labels were aware of the potential of streaming and the disruptive effect it could cause. The signals that download services were slowing down was already clear. And because of the massive piracy in the region, cheaper streaming services had potential to explore. It took us close to 9 months to get the international majors and most of the local services to sign up. What would you say is your proudest moment in the life of Anghami thus far? The first time I saw an Anghami ad on TV was definitely a moment I still vividly remember. I listened to the ad but could not take my eyes off my laptop. Numbers were climbing up through the roof and whatever estimations we had were blown by a huge factor. We were validating demand for our service and I could not be happier every day when I now know that our app has attracted over 6 million people, and counting. What advice would you give digital entrepreneurs who are just starting their journeys in Lebanon? Remember that the first reason of a start-up failure is lack of revenue. Your project will work only if it’s based on proper business engineering.